"While backside illumination has been around a long time for CCDs, and has been investigated for CMOS image sensors, the key aspect of this announcement is that the process has been developed for volume manufacturing for consumer application. This has never been done before and is a major achievement by TSMC in Taiwan - the foundry for Omnivision. The trick is to get the process under such stringent control that the yield is high and the cost is low. Backside illumination will have benefits at all pixel sizes, but is most important for smaller pixels. Improved QE (SNR) and CRA are two of the main benefits. The high volume of camera phones, and to a less extent, compact DSCs, will make the R&D investment pay off. I would consider this announcement as REAL and NEAR FUTURE. All major sensor suppliers are working on backside illumination and Omnivision has fired the first salvo in this PR game. Additional problems remain for pixel size shrinkage (e.g. dynamic range and SNR) and there remain fundamental problems with backside illumination such as instability under UV exposure and bias control, but perhaps Omnivision has made progress on these issues as well." "The mobile camera is a factor of ten different from DSCs. Ten times smaller. Ten times cheaper. Ten times lower power consumption. Little wonder then that it may follow a similar but different trajectory than DSCs." Feisal predicts that "In 2010 and beyond, camera phones start to become a mature technology that provides consistent, dependable DSC-like performance. Auto-focusing, optical zooming, strong flashes and picture quality resemble DSCs." Seeking Alpha: Omnivision presents rather weak results of the last quarter and tells few interesting bits on the state of its technlogy and business. One of our latest architectures, OmniPixel3-HS or high sensitivity has increased our pixel sensitivity deep over our competitors and ensures what we can do to distinguish our products from a technology standpoint." "Shipments of our 3-megapixel sensors have already begun in small volumes and we expect these products will ramp higher through the October and January quarters. We have secured an impressive array of 3 megapixel design wins over the last several months that we believe will result in a relative product mix shifting more towards higher resolutions. In the fourth quarter, just over 60% of our revenues came from mobile phones and just under 40% from emerging products. As for the unit mix in the quarter, VGA and below was just over 65%, 1.3 megapixel was just below 15% and 2 megapixel and above was just below 20%." "Over the past month, we have been demonstrating our initial products – an 8-megapixel sensor based on our 1.4-micron OmniBSI architecture to key customers and partners. We plan to begin sampling this product before the end of June, which should enable our customers to introduce products in the marketplace in 2009. Going forward, we will also apply this groundbreaking technology to larger pixel sizes, 1.75 micron and above, bringing the improvements to our entire product line." "Gross margins of the fourth quarter were 27.2% compared to 27.1% last quarter. Excluding stock-based compensation expense of $697,000 included in cost of goods sold, gross margin was 27.7%, up slightly from the 27.5% we reported in the third quarter. "The 5-megapixel solution is currently being evaluated by key customers – I would say that the way it’s really driven is by the 1.75 OmniPixel3-HS. <...> Obviously, it is going to take a little bit of time to develop the actual design sockets engagement that could generate some revenue." "A quick question on the BSI technology you spoke about earlier. Can you give us a sense of the cost relative to FSI and whether this is going to be used exclusively with the high-end 8 megapixel or is it just technology that over time you want to also migrate down to five, three, two, and maybe even VGA?" "The BSI technology is first being deployed at 1.4 micron and that technology node is an area where due to the size of the wavelength of light being 550 nanometers, to get that technology into 1.4 pixel technology, even competitors using front light illumination are going to have to go to a more aggressive technique to allow their products to actually absorb that light. And even though they go to aggressive techniques we believe the performance of their silicon will be much worse than BSI. So, the comparative price points should be very similar. The real benefit of the BSI technology is that whatever node we put the technology on we’ll get better performance at that technology node. So, we believe, as the market is now looking at higher resolutions which will require the shrink to 1.4 micron and beyond or those customers that are getting off the resolution path and getting into the higher image quality pack that this technology barely squarely puts us in a leadership position to deliver image quality leadership at all those points and also to deliver higher resolutions." "When do you expect to get the first feedback from some of your customers on the samples?" "We mentioned the fact that we’ve been demonstrating with an 8-megapixel product for the past month. We’ve actually been engaged with our customers for the last 6 months with earlier development for the technology and all the customers we engage with are very excited about the technology. So we’ll need to sample them – the 8-megapixel products – next month and move forward from there. 8-megapixel is an important note for them for their planning for 2009. We see a lot of interest in the product." "What are the technical barriers for the competition to do this? What kind of IP is involved here or what kind of a timeline do you have versus the competition to come out with something like this – I am assuming that they are working on this as well." "Our assumption as well will be that the competition is working on BSI. This technology has been around for about 20 years, but it has only been deployed on very large pixels for military and aerospace type applications in a few [cities base]. The real revolution here is the fact that we’ve dramatically shrunk the technology down to 1.4 micron and beyond and that we’re planning on making it in hundreds of millions of units, and to mass produce that takes a lot of wherewithal and architectural expertise around that pixel to do that with great color reproduction and very low noise. We’ve been working on this technology for over 2 years with TSMC very closely and there has been a joint effort by us, and we think that has put us in a good leadership position versus the competition. There are a couple of competitors that talked a little bit about development of BSI. One competitor talked about demonstrating it earlier this year and the only demonstration was in black and white, which is much more common technology than trying to put it into color. So, we think that we’ve got a good leadership position in that we can leverage that into product leadership over the next 1 to 2 years." "Okay, and then the R&D on the backside illumination technology, is that all internal or is that the result of research cost agreements with the TSMC in terms of spending?" "There are no cross agreements. If what you mean – are there any contracts by which we fund any portion of that R&D – the answer is no. We cover our expenses and they cover their own." Don Scansen publishes his analysis and speculations on Omnivision BSI announcement in his Semiserious blog. Quite an interesting read, full of links and history references. Omnivision's PR leaves a lot of space for speculations. Don collects many facts about BSI that are publically available now. Once Omnivision tells more about its technology, it would be interesting to compare Don's guesses with the facts. Yahoo: Kodak CCD Image Sensors are used in the Orbiter Boom Sensor System (OBSS), an in-flight imaging system attached to the end of a 50-foot robotic arm that is used by shuttle astronauts to scan the underside of the orbiter for possible damage before landing. The OBSS is next scheduled to be used on the upcoming mission for space shuttle Discovery, planned for launch on May 31. Used across the shuttle fleet, the OBSS incorporates a camera designed by Adimec, a leading producer of advanced camera systems located in the Netherlands. The camera is based on the KODAK KAI-2093 Image Sensor, a 1920 x 1080 interline transfer CCD imager that provides up to 30 images per second for high-definition image capture. Another Kodak sensor is used in the Earth Viewing Camera, a fixed-point Earth-observing camera located on the International Space Station, designed to capture color images of the Earth’s surface to help increase public awareness of the Space Station. Installed in February 2008, the camera is based on the KODAK KAI-4021 Image Sensor, a 4MP device that includes electronic shuttering capability, a feature critical to preserving the robustness of this camera design by eliminating the need for a mechanical shutter. Surprisingly, these space-based products use image sensors that are unmodified from those available from Kodak for use on earth. Semiconductor International says that Omnivision plans to deliver 8MP BSI sensors in volumes early next year. It also quotes OmniVision product marketing manager Michael Hepp saying that to date, BSI has been difficult to implement at high yields, and that other image sensors vendors are also developing BSI technology. Once implemented, BSI enables NA 2.0 lens in handset cameras, while currently, they are limited to 2.8 NA lenses. Yahoo: Omnivision officially announces that it has developed 8MP backside illuminated (BSI) sensor with 1.4um pixels in 0.11um process. OmniVision is currently demonstrating its 8MP OmniBSI sensor, and expects to start sampling its first products based on this technology before the end of June. There is now word on MP start. This approach is said to allow 1.4um BSI pixel to surpasses all the performance metrics of 1.4um, and even most 1.75um, conventional pixels. It has increased sensitivity per unit area, improved QE and reduced cross talk and photo response non-uniformity and larger CRA. The later enables thinner camera modules with larger aperture lens. 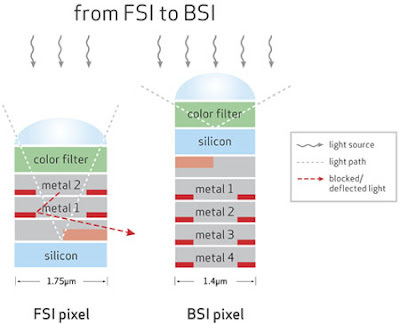 "Moving FSI pixel architectures down to 1.4 micron and below, under current design rules, poses some real challenges because metal lines and transistors are driving the aperture of the pixel close to the wavelength of light, its physical limit," said Howard Rhodes, Vice President of Process Engineering at OmniVision. "To overcome this with traditional FSI pixel technology would require a migration to 65 nm copper process technologies, which would significantly increase the complexity and cost of manufacturing. Because it allows for more than three layers of metal, BSI achieves significant manufacturing benefits without moving to smaller process nodes. This means routing can be simplified and die sizes can be smaller than in FSI sensors, without the need to move to smaller process nodes with all their associated complexities and additional costs." "Although backside illumination concepts have been studied for over 20 years, up until now nobody has been able to successfully develop the process for commercial, high volume CMOS sensor manufacturing," said Dr. Ken Chen, Senior Director, Mainstream Technology Marketing, TSMC. "Combining OmniVision's imaging expertise with TSMC's experience in process development, we have delivered a truly advanced technology that defines the future of digital imaging." Thus Omnivision becomes the first company moving BSI concept into consumer space. This is really great achievement, not only for Omnivision, but for whole the industry! With Samsung showing BSI on its roadmap, I believe other companies will follow the same path eventually. The next big step would be moving BSI into MP. As a side note, we can see a technology divirgence in 1.4um pixel generation with Kodak pursuing hole-based photodiode and RGB-W color filter, Omnivision taking BSI path and Aptina and Samsung following conventional technology (albeit Samsung has BSI on its horizon too). It would be interesting to see these approaches competing once they all reach MP stage. Update: EETimes article downplays Omnivision's innovation. The article says that BSI technology has been around for decades and Omnivision just applied it to consumer imagers. But just looking on the number of analysts commenting on that and interpreting the scarce details, the overall impression is quite opposite: the announcement is taken very seriously by everybody. Tech-On: Japan Broadcasting Corp (NHK) Science & Technical Research Laboratories exhibited an organic color image sensor along with images recorded by the sensor at its Open House 2008. The image sensor is has three photosensitive layers stacked one on another. Each of the layers includes a colored organic semiconductor and a transparent zinc oxide (ZnO) TFT. By using different organic semiconductors for the three layers, each of them is designed to absorb one of R,G or B colors. The first prototype that was made only a week ago and has resolution of 47x30. However, NHK researches hope that one day it would compete with Super Hi-Vision video sensors with resolutions up to 7680 x 4320. Yahoo: Magnachip announced 2.2um 1/10 inch VGA sensor for camera-phones, MC501EA. The sensor has an integrated ISP and is said to fit into 5x5x3mm camera module. Its parallel interface has low EMI. The sensor has an integrated voltage regulator, so a single 2.4-3.1V supply can be used for the whole chip. "Eye of the Beholder" - Can We Measure Subjective Image Quality? When a human observer views an image, a series of psychological responses is evoked, ranging from pleasure to distaste. The physical, biological and psychological processing which results in a particular human response to an image can be quantified and the resulting measurements are referred to as subjective measurements. Find out how we can take and use these measurements to predict future responses. As camera phone resolution increases above 3 megapixels and as the camera module form factor continues to shrink with new innovations such as wafer level optics, the traditional sensor SoC architecture is being challenged to meet both the size and image quality requirements. At the same time, the emergence of highly specialized process technology, such as back side illumination, to improve small pixel performance is causing the growing number of logic gates on the sensor chip to become a cost liability. To complicate matters, during the time it takes for a processor to be designed and ramp to production, the ISP requirements can change several times due to new pixel and optics innovations. In this session, we will show the divergence in requirements, where new pixels and optics technologies are being introduced more frequently and with greater change than can be accommodated by a fixed ISP on a system chip, driving the need for a programmable ISP architecture. Filling this need is a challenge however - combining high processing performance with scalability and power requirements is far beyond the capabilities of general purpose cores available today, demanding new innovative architectures. As much as I like DxO's approach and its attention to details, I wish it finds a right proportion between flexibility and silicon real estate. If it delivers area and power efficient solution, it could be a killer product on the market. Better understand image sensors and how recent developments in back illuminated technologies allow higher volume at lower cost while maintaining the benefits of higher quantum efficiency, broad spectrum response, and 100% fill factor. Learn how improvements in CMOS image sensors will help you gain the full benefit of higher on-chip functionality and higher frame rates. Recent developments in back illuminated technologies allow image sensors with higher volume at lower cost while maintaining the benefits of higher quantum efficiency, broad spectrum response, and 100% fill factor. You'll learn about back thinning processes and their advantages and pitfalls. The benefits of back thinning in machine vision, security, medical and scientific applications will be discussed, including cost effectiveness. Learn about improvements in CMOS image sensor technology that were driven by the cell phone camera market and have put it on par with CCDs for consumer applications. Find out how to implement these advances for machine vision applications to gain the full benefit of higher on-chip functionality and higher frame rates. I was told that CMOSIS is going to present its new global shutter pixel in this session. Thanks to T.B. for the link! Yahoo: Omnivision introduces its first two 5MP Sensors with 1.75um pixels. OV5630 sensor targets mobile phone applications, while its sibling OV5633 is intended for DSC and DSC/DV hybrid cameras. The 1/3.2-inch RGB raw sensors have 960 mV/(Lux-sec) sensitivity. Both sensors deliver 15fps in full resolution, 60fps at 720p high definition (HD) video, 30fps at 1080p resolution or 120fps at QVGA. The interface is 2-lane MIPI. Both the OV5630 and OV5633 are currently sampling, with volume production expected to start in Q4 this year. Digitimes: PixArt announced that it is going to invest NT$150M (US$ 4.92M) to establish a CMOS image sensor subsidiary, with operation to officially start in 2H'2008. Pixart will hold a 30-40% stake at the new entity, with the remainder to be held by other industry players from both upstream and downstream segments. Pixart expects investors to be ready by late June. Pixart itself has decided to focus on special CMOS image sensors, such as featuring multi-object tracking (MOT) technology for games consoles and those for optical mice. The new entity will initially focus on standard CMOS image sensors for use in handsets and PCs. The move is interpreted as a way for UMC, Pixart's parent company, to make progress in China's white-box handset component market. Currently OmniVision holds a 70-80% share of the China handset image sensor market, and UMC probably likes to compete there too. Digitimes published an interview with Omnivision VP of Sales Ray Cisneros. Nothing particularly new in this interview. Ray emphasizes that being fabless and focused on single product type is better. He is concerned by DRAM makers transferring capacity to image sensors to be less sensitive to DRAM market fluctuations. And he says that in Q1'2008 75% of Omnivision sales come from VGA-level sensors, but Omnivision aims to increase higher resolution sensors contribution. I-Micronews: Cypress and Micro-Imaging Solutions (MIS) presented a low cost, high resolution CMOS image sensors encapsulated in a 3D WLP package. The target market is endoscopic equipment, where small size is critical. Sony and Panasonic CCDs currently dominate here, with each CCD sold for hundreds of dollars. MIS plans to penetrate the market with cheap and very small CMOS sensors. To reduce the sensor size MIS has remoted all of the video processing and most of the timing/control circuitry away from the sensor plane. The video processing circuitry can be stacked directly behind the imager or it can be placed several meters "downstream" and be connected to the imager via RF or a disconnectable cable as well. The sensor chip has only the pixel array and some timing and control circuitry in order to make the imager package as small as possible. To me this looks like another application crying for the smallest possible pixel. Then the resolution would become bigger at smaller sensor size. Thanks to J.B. for the info. ImageSensors.org: IEEE Electron Devices Society calls for papers for Special Issue of IEEE Transactions on Electron Devices On Solid-State Image Sensors. Papers submission deadline is Dec. 15, 2008. The planned publication date is late summer or fall 2009. Previous special issues on image sensors were published in 1976, 1985, 1991, 1997 and 2003 or about every 6 years. The 2009 issue is planned to have 35 papers and 280 pages. Thanks to E.F. for pointing me to this. Sony put a slew of new CCD announcements in its recent CX-News magazine. First is a 6db sensitivity improvement of its Super HAD CCDs for security applications. It's achieved by increasing the aperture size and improving the form and height of the microlenses, improved color filters ("complementary color pigment materials") and increased FF. The new 10MP ICX665/675 Series CCD feature 1.68um pixel, while 9MP ICX637CQZ has 1.66um pixel. The small pixel size is said to be achieved due to finer process features and single level interconnect which reduces the optical stack hight. 13.7MP ICX652CQZ CCD is based on 1.75um pixel and has 2x2 pixel binning. With binning enabled the effective pixel size approaches 3.5um at 3.4MP resolution. 2009 International Image Sensor Workshop location and date have been announced. It will be held in Bergen, Norway on June 25-28, 2009, chaired by Albert Theuwissen. Update, May 19: As mentioned in comments, a much more colorful page is here. Digitimes reports that Aptina has started sampling 5MP sensor for mobile phones. Official shipments are planned toward the end of 2008 (sounds like by "official" they mean mass production). It's not clear what is the pixel size in this sensor. It was brought to my attention that Grenoble Minatec Crossroads 2008 conference has quite a good Minalogic image sensors workshop. Thanks to A.T. for pointing me to this. Digitimes reports that Samsung is expected to introduce a 14.6MP CMOS image sensor in June. It was jointly developed by Samsung and Pentax, with Samsung being responsible for the production, and it took two years to develop the sensor. From Digitimes article it's not clear whether the sensor is intended for DSLR or other application. One can see many interesting new technologies that Samsung plans to integrate onto its image sensors, such as EDOF, backside illumination, wafer level module, HDR, high frame rate, MEMS shutter and AF and, finally, 3D imaging. Very impressive list! Digitimes: Nokia opted for Samsung over ST as 2nd supplier of 5MP sensor for its camera phones, as Samsung is ahead of STMicro in pushing the products to market, according to Digitimes sources in Taiwan. Nokia is still buying most of the low- and mid-range sensors from STMicro, while high-end comes from Omnivision and Aptina, according to the paper. Nokia's initial purchase volumes of 5MP imagers from Samsung are lower than the volumes purchased from OmniVision and Aptina. Update: My sources tell that Omnivision supplies only low-resolution sensors to Nokia, while Aptina and Toshiba supply the high-res ones. I guess Digitimes meant that high-end phones have two cameras and Omnivision supplies sensors for the 2nd low-res camera for these high-end phones. Digitimes: Pixart chairman Sen-Huang Huang said that Pixart has started designing CMOS image sensors on 0.13-micron node. So far Pixart mainly uses 0.18um CIS process. Many Pixart competitors use 0.11um or finer processes for quite a some time now. Oki developed "Face Image Processing Hardware IP" to speed up face detection functionality on LSIs. It's integrated with OKI’s face image processing middleware "FSE (Face Sensing Engine)" and provides up to 30fps face detection speed without requiring more CPU processing power. The IP is intended for mid and high-end mobile phones and digital cameras. Its size is less than 300K gates. 3um Pixel - Sweet Spot or Not? It came to my attention that German Image Engineering launched 6MP web site telling there is no need in having more than 6MP in comact digital cameras, as image quality becomes worse at higher resolution. The basic claim is that 3um pixel is the optimal pixel size for compact digicams, thus the maximal resolution should be 6MP for 1/1.5" sensor. One problem with this approach is that technology is progressing and what used to be true a few years ago, might not be true tomorrow. For example, pixel binning, if made correctly, can dynamically scale resolution and effective pixel size. Talking about low-ISO pictures, a high full well capacity is important to get noise free pictures. Historically, smaller pixels had low full well. But there are few solutions in works to provide a dramatic improvement here. Also, various HDR modes should make small pixels more attractive, to some extent. So, it might be true that the old generation 3um pixels are close to the sweet spot for compact digicams. I'm less sure that this statement remains true in a few years from now. Among other things, it depends on when compact cameras switch from CCD to CMOS sensors, as most of these solutions are inavailable in CCDs. Pixart to Make 4T Pixels? Digitimes: Pixart is going to introduce "4T CIS (four-transistor CMOS image sensor) controllers for handsets" in second half of 2008, according to the company president Sen-Huang Huang. If meant 4T pixel products, it would be the first 4T sensors manufactured by both Pixart and its foundry UMC. Yahoo: Kodak announced that its Image Sensor Solutions (ISS) business has received the 2008 EDN Innovation Award in the Sensor Category for the RGB-W color filter pattern utilized in KAC-05020 image sensor. Yahoo: Magnachip announced that it offers a process with industry leading low flicker noise and no required shift of electrical parameters for industry standard 0.18um 1.8, 3.3, and 5.0 volt and 0.35um 3.3 and 5.0 volt CMOS devices. No word on image sensors in this PR, but knowing that flicker noise is often a dominant noise source in CIS, it would be safe to assume that Magnachip applies its findings to CIS process as well. The Inquirer reports that 3D vision technology startup Prime Sense closed its second round of funding, getting $20.4M from Canaan Partners. It's not clear what how its technology works, but it claims to do it cheaper than using reflected laser pulses, like Canesta and 3DV. It's said that Prime Sense device has a tiny optical sensor, which it uses to see the person using it (in the context of his/her surroundings) and also possesses a digital component which acts as its "brain", which can learn from, as well as understand, the various actions of those using it. Aviad Maizels, Prime Sense’s president, says the Prime Sense product is the next generation of interactive devices such as Wii and iPhone, where "a person won’t have to hold anything for his electronics to understand his movements”. According to EETimes Prime Sense is rumored to have design win with Sony EyeToy, the planned alternative to Nintendo Wii motion controller. Seeking Alpha published a supposed picture of an oncoming Moto-Kodak phone and parts of Antonio Perez last fall talk about the future camera-phones. It the rumors are true, soon we'll see the performance of Kodak's new RGB-W color processing and, may be, its new 1.4um pixel. The Korea Times: Hynix spokesperson Park Hyun said on CIS progress: "There is no change in our schedule to manufacture the product, in addition to our plan for 2-megapixel and 1.3-megapixel products on our M7 line." He added that the company will provide its foundry services to the strategic partner SiliconFile with the latter buying the products at an "appropriate" level. Hynix also plans to make sensors for automotive later this year: "From the latter half, we will produce image sensors for car navigation systems," Park said. Fake Image Sensors Starting to Appear? Semiserious posted an interesting story on image sensor fakes having just one metal layers covered by color filters and microlens. The 10-device lot was acquired from Chinese distributor. It was supposed to be "a certain leading CMOS image sensor supplier’s device who is known to use a certain leading Asian fab to manufacture its devices" (Omnivision?). A theory is discussed that this might be a mechanical testing lot somehow finding its way to a distributor. As more reverse engineering research is being done on it, the story might continue. Barron's: American Technology Research analyst Doug Freedman said "weaker handset trends" and competitive pricing at some sensor resolutions are to impact Omnivision business. He writes that the market for 2MP sensors “is becoming extremely competitive". Freedman also concerned about Omnivision’s business with Sony-Ericsson, which reported a 28% sequential decline in handset units in the first quarter.